‘Low-level, persistent disruptive behaviour in England's schools is affecting pupils' learning and damaging their life chances’. Inspectors have even noted that it impacts on learning!!! Well quite! You don't need Sherlock Holmes to work that one out! Ofsted even say that some pupils could be losing up to an hour of learning each day - or 38 days a year. In many schools this will be no doubt higher and this doesn't factor in the influence of an inspector in the room. They have put everything together in a report: Below the Radar: Low-level Disruption in the Country's Classrooms - it is based on the inspection reports of a sample of 95 state schools and academies inspected between January and July this year. This includes evidence from 28 schools that received unannounced inspections and where behaviour had previously been judged to require improvement. The report is also based on a YouGov survey of 1,024 parents and 1,048 teachers. The report says too many secondary schools underestimate the prevalence and negative impact of low-level disruptive behaviour and some fail to identify or tackle it at an early stage. My approach to delivering this course is to see the solution has falling into three aspects. If we can get all three right then the incidences of low level disruption will drop. A useful departmental meeting focus would be to consider what the results might be for a teacher who only focuses on say 1, 2, 3, 4, 5 or 6. What kind of classroom would it be? Often it can be an over reliance on 3 at the expense of the others that results in some short term gains but in the long term wont lead to the quality learning experiences you would want. 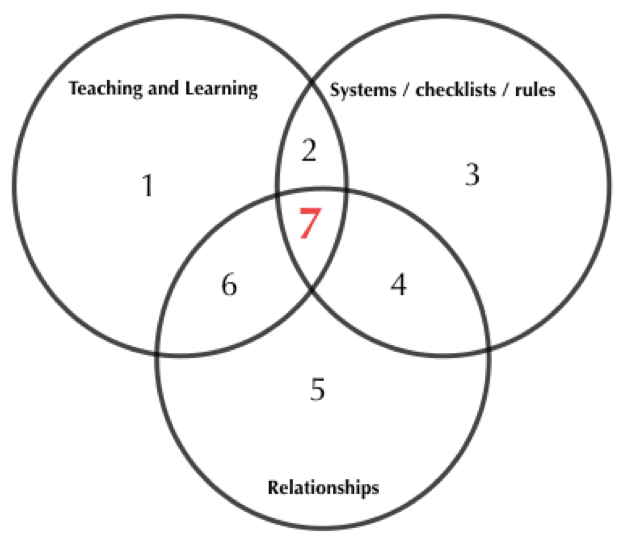 Our training day suggests that the ‘sweet spot’ would definitely be 7 - where all three aspects intersect.